Chris Probert talks on using volitiles to predict response to diet including the FODMAP diet. How would a biomarker for a ‘functional’ condition change our approach? The ‘low-hanging fruit’ of cases that can have hepatitis c eliminated have been picked (prisoners, stable drug users, etc). The next phase will involve case finding – of people who once tried injecting drugs at a party in the 70s, who had a tattoo in Egypt on their year out, come from a high risk area, have abnormal LFTs taken for another reason. To be successful there is a need to engage with primary care (which workers in the field describe as ‘a hard to reach population’). What is the quality of the evidence that seems to show improvements in cardiovascular, musculoskeletal and cognitive function by giving iron to patients with normal haematological indices? Does this lead to reduced post-operative bed occupancy? Should we be doing it yet? AI, big data, personalised therapies, robots – what is the place for the primary care doctor in the brave new world? What will be the place of the traditional consultation? Does continuity of care still matter? 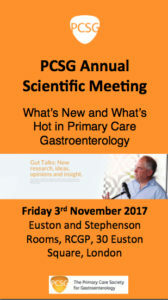 And much more – including the popular 3-minute updates in Nose-to-Tail gastroenterology.